Joomla 3.5 was released on February 17, 2016. Here is a glimpse of what will be on Joomla 3.5. Joomla users have the opportunity to test the beta and pre-release versions given by the official Joomla development team. If you are using Joomla and would like to contribute or you just want to test the latest features of Joomla 3.5 and its extensions, of course this is very useful. You can find some of the features that may not have been perfect and needs to be improved to be released in due course. This time I will show you how to test the beta version of Joomla 3.5 on your website that Joomla version 3.4.x. # Note: Do not do this test on your website is running, it helps you create a duplicate to avoid the risks that can be generated. Access to the menu Components -> Joomla Update -> Click on the "Option"
Update Enable Channel to "Testing"
Then click the "Save and close". 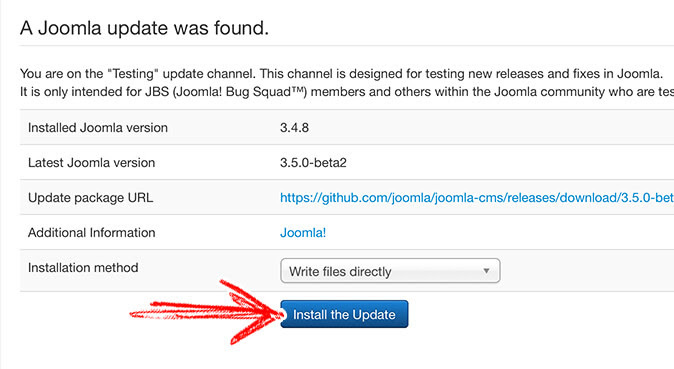 If there is a Joomla test version available (it will commonly use the suffix -beta # in "Latest Joomla version" row), click the "Install the update" button and wait until the process ends. Until this stage, you have managed to make updates to the Joomla 3, if you find features that have not been perfect, immediately report it to Github repository page, hopefully Joomla core team can fix it on the next regular release schedule.